The study explores the application of edible plants in modern cities, in order to help understand today’s trends shaping the urban environment. Edible Landscaping is referred to as the practice of incorporating food – producing plants in the landscape. Fruit and nut trees, vegetables, herbs, edible flowers and shrubs with berries can be combined to create an attractive design that produces fruits and vegetables for home consumption. It is an approach to food production where exotic ornamentals are replaced with edible or productive plants. Through analyzing the developments of urban farming, community gardening and the like, a set of example projects were selected in order to help understand the impact they have for the landscape architecture and planning practice. In the process, many solutions for the use of edible plants were revealed, showing the importance they have in communities around the world. Edible landscaping could be the answer to solving issues of food supply, safety and production for the near future. As demographic growth proves to force agricultural expansion with its constant demand for food, how could urban planning professionals address this constant need for productive landscapes? This thesis offers a design concept that combines public open space with the emerging horticultural trends of urban food production, placing a strong emphasis on education in an attempt to match the needs of local food production and the shortage of land. 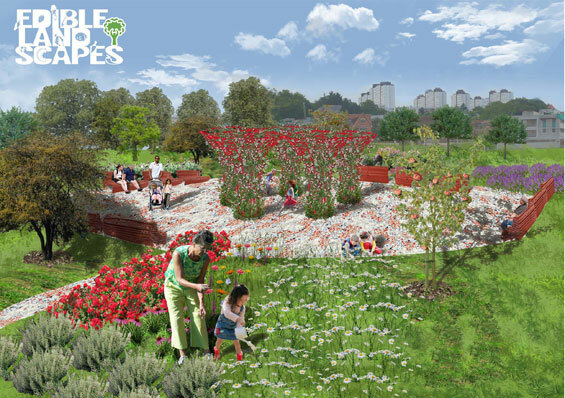 Edible Landscapes gives practical guidelines aimed at both professionals and people with lay knowledge, for the implementation of edible plants in urban environment. 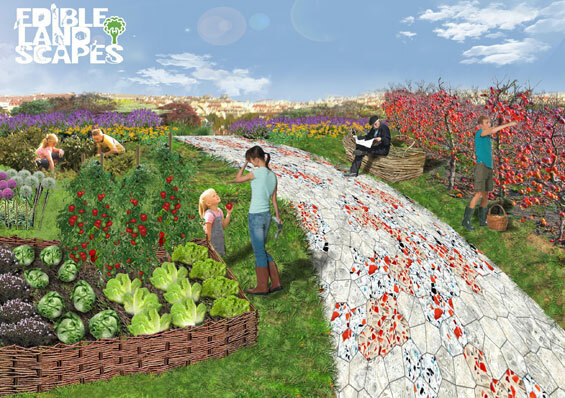 Several requirements were defined for the Edible Landscapes project, in order to find a balance point that would preserve open public space functionality combining it with the productive functions of vegetable and fruit growing. It has to be publicly accessible, give opportunities for commerce, be educating and entertaining, and to give an identity to a community. 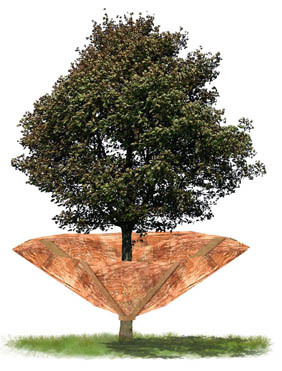 A basic prototype was developed that consists of 5 modules that define the plant groups that will be used. An important function of the prototype and its modules is to be applicable in different places. For that reason the modules can be reshaped and resized like a jigsaw puzzle to fit wherever necessary, attached differently or disassembled from the whole. The concept was applied for a site in the 23rd District of Vienna – Liesing. 2 zones with different functions are created. 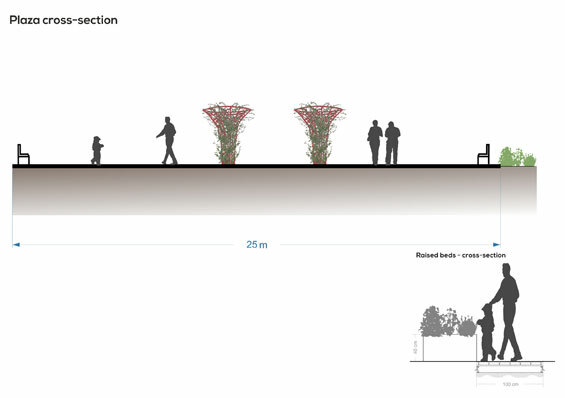 The 1st one is formal, with broader paths connecting the entrances with the central piece of the site – a plaza (approx. 25 m. diameter). The plaza is the gathering and recreational place in the project. 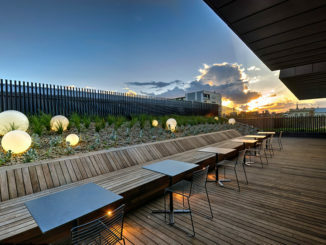 It facilitates most of the seating and 5 trellis structures, especially designed to create a visual impact. 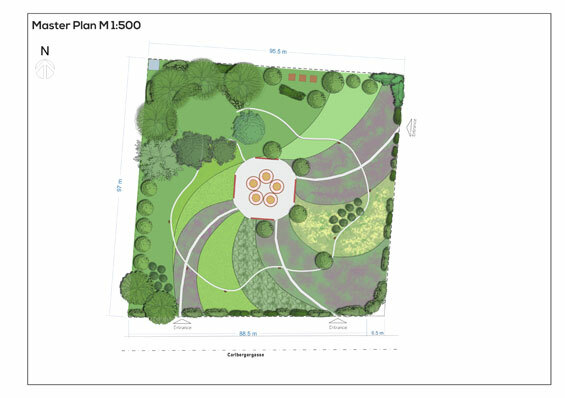 Inspiration for their shape was some mushroom species, which adds to the organic design of the place and a much needed shade, since very few trees could be planted in order to provide more sun for the vegetable and flower beds. Coloured in bright red, they will continue to enhance the surroundings even in winter. The vegetable beds and the flower/herb groups are located along the 2nd zone of the site – the exploration path. It curves in irregular shapes along the open space, creating a more intimate informal setting it gives an easy access to the vegetable beds and shows the plants in a different perspective, compared to the formal pathway. Along its sides woven benches are placed to provide rest for the people. Both ends of the path lead the explorer of the edible landscape to the grove. It is situated in the North-West corner and is a more natural area, where woven structures and tee-pees are situated for children to play with. It is shadier and surrounded by trees and raspberry shrubs, creating a refreshing recreational place for the hot summer days. 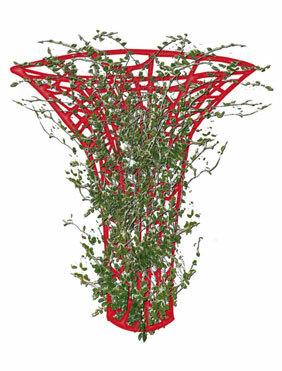 A special net device was designed in order to prevent accidents during the harvest period – this way children will not rush to climb the trees to pick up fruits. Milkana Mladenova (from Bulgaria) – a student at the International Master of Landscape Architecture at the Universities of Applied Sciences in Fresing and Nuertingen, Germany.